Its summer for the northern hemisphere. Levittown residents know this means the pools are open! You've got your towel, flip flops, goggles, water bottle, but forgot your sunscreen. DON'T WORRY! Town Of Hempstead Health Department cares about keeping you well. 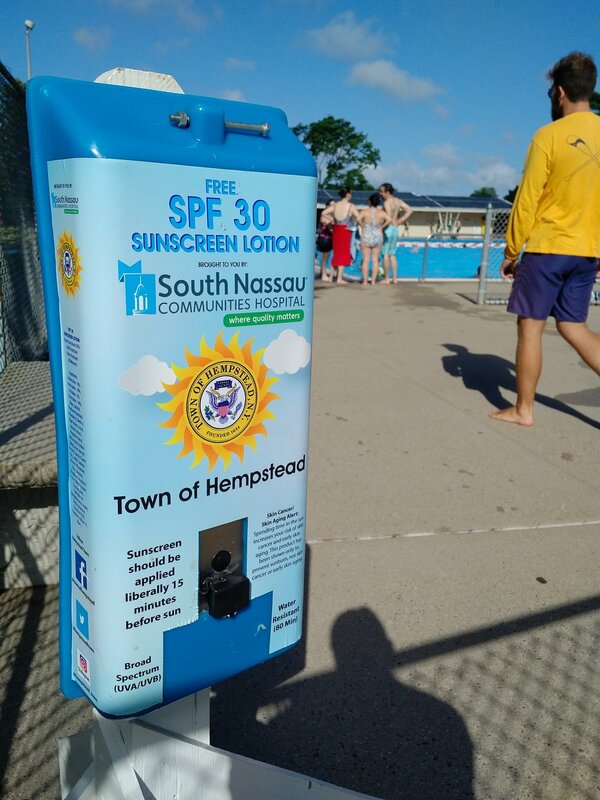 Something new at the pool is FREE SUNSCREEN! Something not new is BAD POSTURE. Take a look at the background action. What do you see? You might not notice at first glance, but these people are off balance. They're leaning so far in one direction that their body has to compensate in various places just to hold them upright. Do you know what that means for their health (and yours) down the line? Look again. What do you see? They're all standing with their hands on their hips. Familiar? Have you found yourself standing for a period of time and either crossed your arms over your chest or propped yourself up on your hips? If you're like most people, you've done it without even thinking of it. Your body does it on its own, its called compensation. 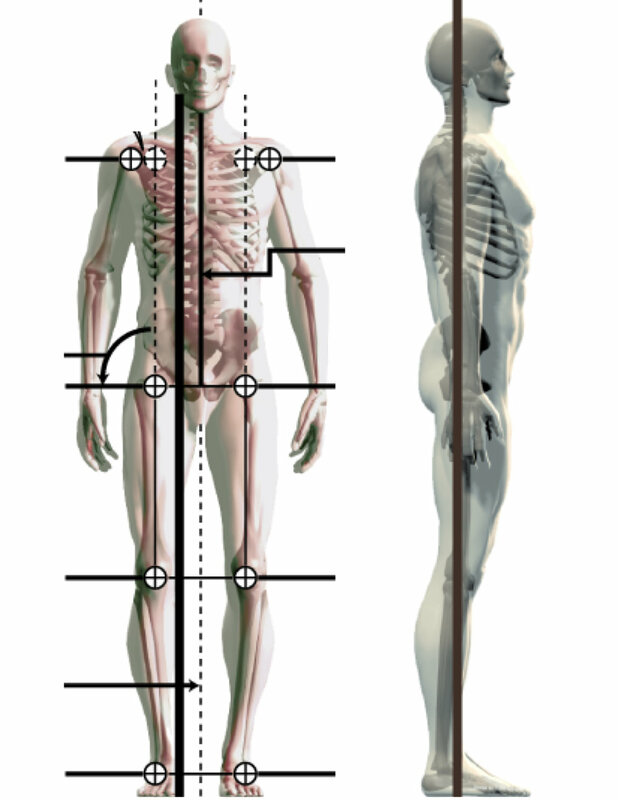 The postures in this photo are of people displaying rounded upper back and shoulders, and excessive lower back curvature, to name just a few deviations. Even the lifeguard falls into this category, and he is living an active lifestyle. Does that sound typical? How about normal? How about something is wrong here, and we are missing a huge component to our overall health! Just like the postures above, this building is off balance. Its falling down. But it doesn't have any cool compensatory responses to keep itself upright on its own. Instead it is getting propped up to stop the decline, at least for a little while. Notice anything familiar? This is exactly what the people in the top photo are doing for themselves. Their muscles aren't working to keep them in accordance with their original design. Some are 'asleep' while others are OVER WORKING, and the body is falling down. It supplies the props just like the steel supports on the building, but it uses your arms instead. But we are different than the building. We can adapt, heal, twist, run, jump, crawl, climb, push, pull you name it. You see most of us lack QUALITY motion in our daily lives. You are probably saying, 'I workout every day'. But so is the lifeguard, and so is the other family beyond the frame of the photo. Michael Phelps a tremendous athlete, displaying musculoskeletal compensations. Most of the motion we give ourselves is repetitive motion that gets patterned into our body and stays. Even the workouts we get at the gym are focused more on encouraging EFFORT rather than QUALITY. Burn CALORIES, rather than have FUN (more on that in another post). Do what the instructor says, rather than explore all motion. We rarely take our bodies through full capable range of motion, much less strengthening it there. So it holds tight to the pattern it considers 'safe' and forgets the rest. Gyms focus mostly on effort to burn calories, not quality movement that creates sustained health. If you WON'T move, you CAN'T move over time, and we head past compensation into dysfunction. Sounds scary right? Its not. Its just another adaptation that our body has in its bag of tricks to keep us as well as it can. Thats right, compensations, dysfunctions, and adaptations are all in the plan. Because if we couldn't adapt, we would be like that building, hopelessly stuck waiting for someone from Monster Garage to weld upright stilts onto our falling torso. The building needs to return to its blueprint design. It won't last long with those beams holding it up, and it certainly won't perform like it did before, ie. holding hundreds of people inside safely. Your body needs to return to its design too. And it can do it more easily than you think (more on that in another post). If it does not, no amount of sunscreen will help get you to the pool when your back is out!